Why is Blue and Red Light important? You may have heard about the importance of blue and red light for plant photosynthesis already. There is a lot of truth and misconception mixed in regarding these colours and their use in grow lights. It is important to note first that all visible colours of the spectrum are used by plants, but for now, we will focus on blue and red light and what can be achieved with their use. For the two photosystems I & II, chlorophylls a & b exist to assist the photosynthetic process by absorbing specific spectra of light energy. Chlorophyll a absorbs the violet blue - blue wavelengths of light (390-450nm with peak at 420nm) and orange to far-red (600-700nm with a peak at 680nm). 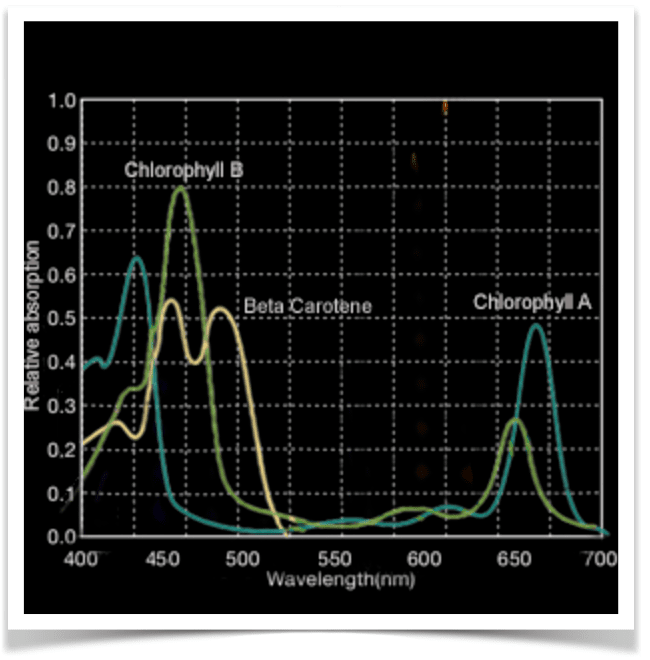 Chlorophyll b however absorbs violet blue to green blue light (390-500nm with a peak at 480nm) and yellow to red light (600nm-680nm with a peak at 630nm). Plants still use the green and yellow spectra as there exist photopigments that turn green or yellow photons (500-600nm wavelengths) into blue and red photons through excitation and emittance reactions. Blue light is of course a main contributor to photosynthesis via chlorophyll, but it also influences a plant in other ways. Blue light is typically encountered in nature at midday, when the angle of the sun is directly vertical or close to it. This would usually be a time of peak intensity and heat, therefore in many plants high intensities of blue light cause the chlorophylls to migrate to the bottom of the cell for shielding. Moreover, cryptochrome is a phytochemical that absorbs the blue spectrum and initiates phototropism (growing towards light), plus sets a plants circadian rhythm (in combination with phytochrome and the photoperiod). Interestingly, strong blue light reduces leaf intermodal length in a plant and causes it to grow compact and bushy, not wasting energy on stem length, which would be unnecessary in blue dominant full sun conditions. Many growers use blue light to keep plants compact and under control. In addition plant stomata number increases with the intensity of the blue light fraction, possibly increasing photosynthetic rates further. Carotenes (an antioxidant orange pigment in carrots and many orange fruits and vegetables responsible for vitamin A) are stimulated by blue light, producing an orange - red spectrum through excitation and emittance. Similarly, many flavonoids are produced in the plant using blue photons (and others). Flavonoids help a plant filter out UV light, produce colour to attract insect pollinators, for nitrogen fixation, immune system and cellular function. Anthocyanin and flavonoids are heavily dependent on blue light, produced through phototropins in biosynthesis. Lycopenes are another product generated with blue light and have great health benefits for humans. Tomatoes grown under lights with a strong blue presence will have much higher lycopene levels than under those without. Red light is the second main contributor to photosynthesis, but similarly to blue it produces unique results in plant physiology. Red light exists most when the sun is low in the sky, which is winter, morning and evening. You can imagine that a plant will know what time of day it is by the presence of red light, and you would be right. Phytochromes are phytochemicals that carefully observe red and far red light, specifically the balance between them, and set many decisions based on this balance, such as elongating stems to beat crowing via other plants, setting seasonal or daily flowering period, budding, and contributing to plant circadian rhythm. For more information on phytochromes and their use, please see our article ‘Phytochrome Manipulation. Red light is special in that it can deliver high growth to a plant, but without the limiting effect of blue that obscures the chloroplast to protect it from high-blue midday sun. Therefore red is very efficient at producing fast growing tall and strong plants and indeed produces some of the most impressive growth rates of height and stem width in plants. At excite our lights have channels that allow you to choose whether the emitted spectrum is blue dominant (GROW), red dominant (BLOOM) or full spectrum. We have produced the following guidelines for your consideration. If you want compact and bushy plants, keep GROW on only. Conversely, if you want tall and vigorous plants turn GROW off and keep BLOOM on. Keeping both on will give you a healthy and nutritious plant however, but pure red will grow your plant tallest. If you want the most nutrition in a crop, make sure GROW is on at all times.